Home / News/ Why is Karadiyana waste project yet at a standstill? Public concern is on the rise again regarding the Karadiyana mass scale waste project and the government’s inability to proceed despite the private developer, Fairway Holdings’ Fairway Waste Management (Pvt.) Ltd. having completed all necessary regulatory matters up to now. In the latest development of the crisis, three senior academics, namely Prof. Ajith de Alwis - Senior Professor in Chemical & Processing Engineering, Dr. Thusitha Sugathapala - Senior Lecturer from the Department of Mechanical Engineering, and Dr. Jagath Manatunga - Senior Lecturer of the Department of Civil Engineering from the University of Moratuwa, who were instrumental in evaluating and recommending the project to the government, have called attention to the lack of progress of the project through letters addressed to HE the President Maithripala Sirisena, the Prime Minister Hon. Ranil Wickremesinghe and Minister of Megapolis and Western Development Hon. Patali Champika Ranawaka. The academics were invited by the UDA to evaluate the proposals submitted under the terms of a RFP floated by the UDA on 27.12.2015. The proposals including the technical merits and capacity of the developers were submitted subsequently. Two projects were chosen for two separate sites, Karadiayana and Kerawalpitiya waste zones. A consortium led by Fairway Holdings was chosen to implement the Karadiyana project based on the merits of the proposal it submitted and the developers’ financial capabilities. Prior to the final approval both finalists had to respond to a further detailed set of queries, ensuring a fair process and the ability to meet stringent environmental regulations as well as strict commissioning timeline due to the criticality of the waste disposal issue. The developer moved to implement the project to meet the strict time lines that were imposed by the selection committee. It obtained the necessary regulatory approval and went through a stringent environmental impact assessment (EIA/ IEE), and obtained approval from the Central Environmental Authority (CEA) to execute the project. A detailed and thorough IEE was submitted as per the ToR of CEA and is available to the public. The consortium established a special purpose vehicle - Fairway Waste Management (Pvt.) Ltd., which jointly with the WMA started the development work. The cabinet approved a special a feed-in-tariff that was recommended by the Public Utilities Commission (PUCSL). There were some concerns that were raised by the Ministry of Finance on the tariff payment mechanism that the CEB had requested and the project was delayed until these matters had been resolved. Just last month the cabinet had given the final approval for the CEB to sign the Power Purchase Agreement with the developer. However, it is understood that the developer is still unable to execute the SPPA to continue the project. The matter is rather disturbing; first and foremost a private investor who came forward to take on a risky project has seen its execution delayed due to bureaucratic quagmires. Secondly the waste disposal issue has gone from critical to dangerous and all those who are around the site and including those at distance – University of Moratuwa included - are subjected to unpleasant and health threatening emissions. In the letter, the academics foresee an extremely difficult situation faced by the WMA if the delay continues. Thirdly, the delay in the project continues to put the public in the vicinity of the landfill in danger. 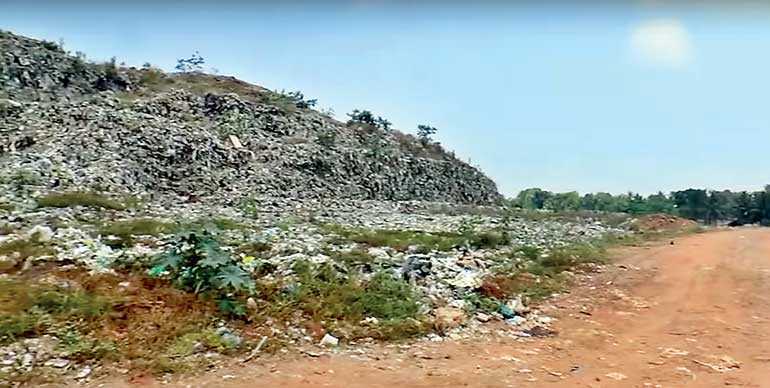 Slopes of the Karadiyana waste dump are probably reaching a crisis situation and Sri Lanka cannot and should not go through another episode similar to the Meethotamulla incident due to solid waste dump failures. “We fail to see why the project is not allowed to go forward when the developer has met the conditions of the award and has been steadfast and transparent in its execution. A solution to a crisis being ignored in this manner is quite difficult to comprehend considering that the entire project proposal-to-award has been followed with due diligence. This is a sound, well-conceptualized project executed with the backing of reputed consultants and a capable and dedicated local team. The developers have shown a keen interest to corporate with the universities and to make data and resources available to educate engineers and waste management professionals in cutting edge technologies that they have proposed to bring to Sri Lanka,” states the letter. The technology is long overdue in Sri Lanka and the implementation of this project would not only have been the solution for the disposal issue but also Sri Lanka leap frogging to a new and modern waste management regime. However, the need of the hour is for the project to remobilize so that it can be commissioned sooner than later.